Mosaic (from the Latin. "Musium" - "dedicated to the Muses") is a color drawing, created from small or different in size elements. Some of the mosaic images of the ancient era have reached our days and now amaze with their beauty and luxury. Today, the mosaic is increasingly used in interior decoration, due to its durability and excellent abilities in decorating the interior in any style, including high-tech. Many of the ancient secrets of creating a mosaic are lost, but modern production technologies allow to obtain almost any mosaic composition. Not only the picture but also the material plays a huge role in the creating of a mosaic. There are glass, smalt, ceramic, stone, and metal mosaics. Smalt is a type of glass. However, the smalt initially contains natural components (potassium salts and other elements), which give the material a natural color. 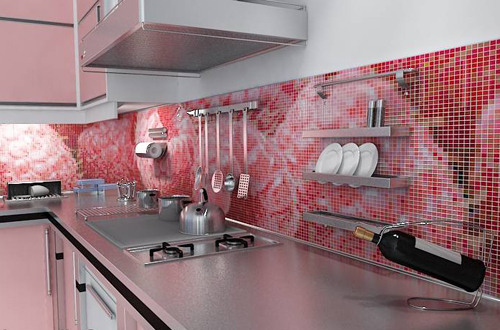 Glass mosaic has important positive properties, among which are the strength, resistance to chemical attack and fungi, heat resistance and frost resistance. Due to its resistance to sudden temperature changes, it is often used in cladding the outer side of fireplaces and stoves. Glass mosaic can turn any interior into a space of fairy tale and chic. It will perfectly decorate the kitchen, bathroom, dining room, hallway, and even the living room.